Strip It | Pro Chem, Inc. 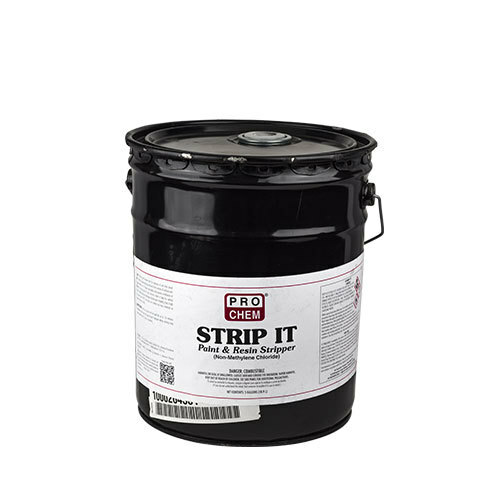 STRIP IT is a highly effective paint and resin remover that is ideal for removing oil and latex paints, shellac, lacquers and polyurethanes from a variety of surfaces such as wood, metal, etc. Its nonchlorinated formula’s slow evaporation rate makes it ideal for vertical surfaces. Unlike most nonmethylene chloride paint strippers, it has a high flash point and does not contain toxic chemicals such as toluene, acetone or MEIK. Brush on surface and let soak for up to 30 minutes depending on the type and age of paint. Two-part epoxy coatings may require soak times of 2 hours or longer. In certain thick coatings, several applications are necessary. Remove with cold water preferably under pressure. Wire brushing is helpful for faster removal.